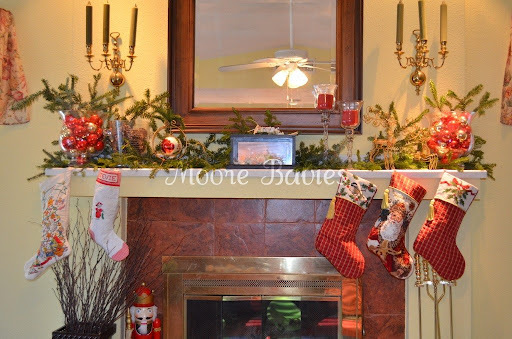 Moore babies: Decorating? Just add greenery! Ok, as I am STILL waiting for baby to arrive (ok, ok, I'm not even at my due date yet but both other girls were early, so I'm impatient! ), I am finishing up some decorating and I wanted to share another small tip! This year is different; we are in limbo with moving (although we got an update yesterday) so a lot of our stuff is in boxes from when we thought we were FOR SURE moving, so I don't have my usual stuff out. 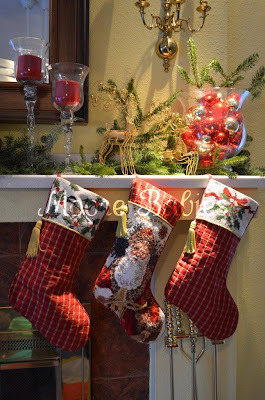 So I was a little worried that my mantle wouldn't look right for Christmas. Also, we took down our HUGE wall unit where I put my Christmas village and various other Christmas decor is no longer available. AND since we didn't take all of our Christmas decorations down from the attic I am missing some of my prized decorations, bleh. 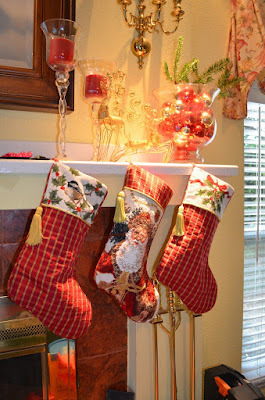 That said, here is our mantle (PS, this is the picture from the "Stocking Hanging tip" post). I have a mixture of red and gold glass balls in a globe vase, some red candles, and shiny gold reindeer. Not too shabby. Actually, somewhat festive. Here is our full mantle, I don't have a lot of Christmas stuff up, but with the greenery it looks super festive. Plus, it smells awesome and then after the holidays we get to burn the trimmings in the fire place. Win-win. I used the trimmings from our live tree, but you can either go buy some trimmings from places that sell trees OR run by lowes and go through the dumpster by their trees (I did that last year to get some extra trimmings). The greenery really does perk it up! I'll have to try that with our mantel. Thanks for the idea! Your mantelpiece looks beautiful - so festive! Heya, Visiting via from Ray Gun Ramblings. The greenery really goes make all the difference! I found the same this with my mantle.